It is essential to test the cable before, during and after the floor heating system installation. The Alligator is a meter with six-inch alligator clips, that allows the constant monitoring of the heating cable. By testing the electrical resistance (ohms) on the heating conductors and any leak to the ground, it provides the installer the guarantee of a job well done. THE ALLIGATOR MULTIMETER IS SIMPLE TO USE TOO. By clipping the meter to the leads and turning on the device, it will remain accessible and powered all the way through the process, such as floor prep, tiling, and grouting. Furthermore, anyone present on the job site, from the installer to the tile person, the manager or the general contractor, can double check the integrity of the system at any moment. In addition, unlike the other testers, The Alligator will give clear and detailed status on the installation with the exact ohm measurements required for warranty filing for all floor heating products. For large jobs, Warmup recommends the use of a megaohmmeter during testing. The megger is used as a quality control measure to test the insulation resistance, to detect any fault in the heater cable jacket. Such leaks cannot be spotted with a regular ohmmeter and help spot any damage to the cable and cable jacket. The megger sends voltage through the cable to calculate the amount of current flowing through the circuit, for an accurate indication of insulation integrity. Higher resistance means good insulation. Click here for full instructions. Warmup offers a selection of kits to repair damaged indoor and outdoor cables. Warmup’s 3-ply waterproof membrane protects floors and walls under thin-set tile installations from substrate cracks and moisture migration. It is comprised of 2 outer polypropylene layers and one inner polyethylene waterproofing membrane and exceeds testing requirements per ASTM 118.10. 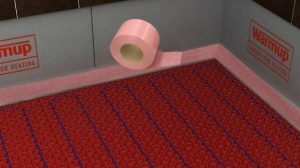 The kit includes a 35ft roll of 5”-wide membrane, along with 2 outer corners and 6 inside corners to complete waterproofing in most common bathrooms under 100 sqft.